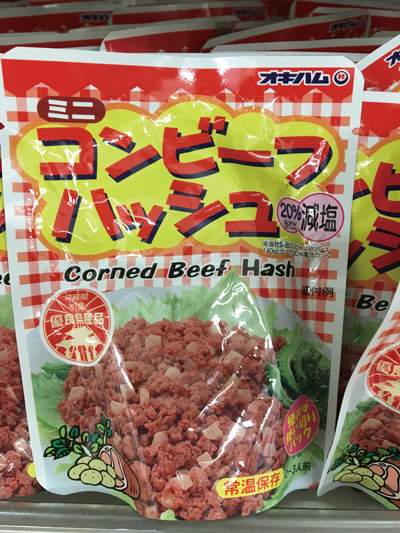 Corned beef hash is a good and popular canned food for typhoon season in Okinawa. It’s easy to cook, just heat it in a pan or microwave, and eat it as is or use it as an ingredient in meals. People eat it soups, with fried rice, in omelets, or cook with vegetables such as cabbage, carrots and goya to make a champuru dish. As it’s a little salty in itself, so no salt is needed when it’s mixed with other ingredients. 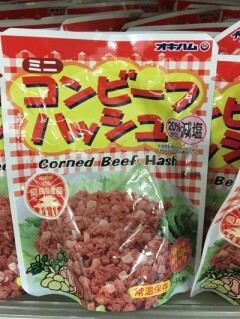 Corned beef hash is sold in all grocery shops and convenience stores in Okinawa.